Beauty treatments in the comfort off your own home. Tints, Waxing, Facials, Make-up, Aromatherapy Massage, Swedish Massage. 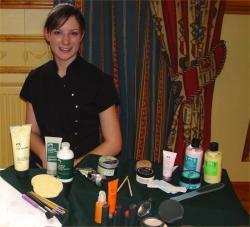 Wedding Packages - include Manicure, Facial, Trial Make-up, Waxing, Eyelash/browtint, Make-up, File and Polish. Package includes facial treatments once week for four weelks brefore the wedding and waxing two days before hand.